Casa de Paz: Our charming 2-story townhome, built in the mid-1970s, has been completely updated. All rooms are colorful, comfortable, and artistically appointed with Southwestern art. The master bedroom features a King-size bed, 2 bedside tables with reading lamps, an antique dresser with mirror, and two double closets. Our pine headboard with marble stone insets was hand-crafted in Mexico, and our brightly colored bedspread was hand woven in the Zapotec village, Teotitlan del Valle, in the Mexican state Oaxaca. The middle bedroom has a Queen-size bed, bedside table, wall mounted reading light, and a spacious closet. The third bedroom contains twin beds, bedside table, wall-mounted reading lights, an antique dresser, and a large closet. Additional towels, linens, and blankets are available in each bedroom closet. There is an iron and ironing board in the master bedroom closet, and each bedroom closet contains a luggage stand. 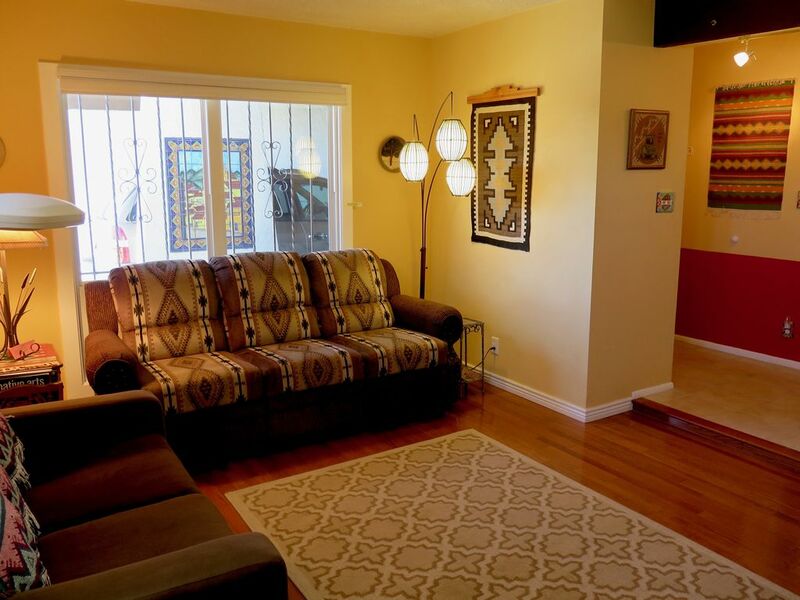 The living room has a Southwestern couch with 2 reclining seats, microsuede reclining chair, brown fabric love seat, 32-inch TV with cable, DVD player, WiFi, and a bookcase with books, puzzles, and games. Along with other books, there is a set of 15 hardback Navajo mysteries by Tony Hillerman. The well-equipped kitchen has a breakfast bar with three stools and is open to the dining room which has a dining table that will seat 6, a love seat, a corner computer desk, a side table with a radio & cassette/CD player and music CDs. The dining room’s sliding glass door opens to our private patio that is completely enclosed and partially covered. The patio has a table with umbrella, 8 chairs, wicker love seat, BBQ grill (charcoal & starter fluid provided), flagstone flooring, a high adobe wall and wood fence, and a seating banco. There are a washer and dryer next to the kitchen. The home has one full-bathroom and one half-bath. The full bathroom is upstairs by the 3 bedrooms and has a tub/shower combo. Both bathrooms are spotlessly clean! The home has refrigerated air conditioning and forced air heating controlled by a thermostat, and each bedroom has an additional fan. We have parking for two vehicles in the driveway & carport and additional parking is nearby. Free WiFi reaches throughout the townhouse. 2019 INTERNATIONAL BALLOON FIESTA, Oct 4 - 13 (We have vacancy). The past fiesta had 672 balloons from 22 countries and 888,000 guests! Book now. Our location provides easy access to one of the fiesta's Park-N-Ride locations. We are located on the west side of Albuquerque with quick access to I-40. We are close to the Petroglyph National Monument Visitor’s Center (1.5 miles), Ladera Golf Course (1.3 miles) and only a short drive to Old Town (4 miles), many museums (6 within 4 miles), Cottonwood Mall (6.5 miles), the Rio Grande Nature Center State Park (5 miles), the Rio Grande (access to the river & bosque is close by), Open Space Visitor Center (4 miles), Botanic Garden & Aquarium (4.5), Rio Grande Zoo (5.5), walking trails, theaters, and restaurants. Albuquerque is an easy city to get around in. Please: no partying and no indoor smoking. We accept longer-term reservations and can offer special rates for snowbirds & others who desire an extended stay. I am a retired educator. I have been married to Cathy, also an educator, for 49 years. We have two sons and many grandchildren. We enjoy traveling, hiking, bicycling, reading, writing, crossword puzzles, and spending time with our family. I grew up in Oklahoma (elementary school years) and Colorado. Cathy grew up in Colorado. We met and married at Colorado State University. Cathy and I moved to New Mexico in 1974 and we love living in Albuquerque. I take the main responsibility for our townhouse, but Cathy happily pitches in when needed. We live near the townhouse and are always available to help with planning your time in Albuquerque. We love Albuquerque's westside where modern meets ancient. The vibrancy of the city butts up against ancient rock art carved onto volcanic rock just over a mile away from Casa de Paz. The townhouse is conveniently located near the intersection of I-40 and Coors Blvd allowing quick and easy access to ABQ's many wonderful attractions. We are only minutes away from the Petroglyph National Monument Visitor’s Center (1.5 miles) and its many hiking trails, Ladera Golf Course (1.3 mi), Old Town (4 mi), many museums (6 within 4 mi), the Botanic Gardens & Aquarium (4.5 mi), Rio Grande Zoo (5.5 mi), the Rio Grande Nature Center (5.5 mi), Open Space Visitor Center (4 mi), city parks, multi-use trails in the bosque paralleling the Rio Grande, Pueblo Indian Cultural Center (4.5), Cottonwood Mall (6.5 miles), theaters, balloon rides, great restaurants, and so many other great attractions. Our location offers easy access to our diverse cultures, history, art, architecture, food, concerts & live theater productions, outdoor activities, and our outstanding university. Our location offers easy access to the Park & Ride buses available during the Balloon Fiesta (early October). Our adobe-walled, private patio is the place to begin your day with a cup of coffee or tea, and then it's the place to relax with your favorite beverage after your day of sightseeing and exploring. Huffington Post calls Albuquerque "one of America's Five Secretly Cool Cities, offering authentic southwest culture by the bucketful, a seemingly endless number of multi-use trails, an inexpensive gondola ride to the peak of Sandia Mountain, and, of course, artisanal green chile cheeseburgers. Add in the region's unique multicultural heritage (architecture, a ton of good food, festivals, local traditions, and so many wonderful people!) and you've got a city that's not staying under the radar forever." Casa de Paz provides an ideal location providing quick and easy access to our city's many wonderful features. Many publications have ranked Albuquerque as one of America's top travel destinations. National Geographic Travel named Albuquerque as one of "The Best Cities in the United States." Today's Parent says ABQ is one of the best destinations for Springtime Family Travel. Travel+Leisure and Groupon say that we are one of the friendliest cities in America. Travel+Leisure also picked ABQ as one of the most charming cities to visit. USA Today says that we are one of the most Wildlife Friendly cities. ABQ is on Outside Magazine’s list of the 10 Best Big Cities for Active Families. National Geographic says the 550 hot air balloons that launch during our Balloon Fiesta present a "forest of billowing color." This is perhaps the only mass launch of balloons where visitors can wander the 78-acre field right next to the launching balloons. And the Travel Channel places our Botanic Garden in the top 5 in the country. The Botanic River of Lights display was named one of "The 15 Most Spectacular Holiday Light Displays in the U.S." by MSN. So please come stay at Casa de Paz and enjoy the many wonderful virtues of our city. 2 sets of clean sheets, 2 blankets, 1 bedspread per bed. Beds are neatly made up prior to your arrival. Two vehicles can be accommodated, one in the carport and one in the driveway. Additional parking is nearby. Southwestern design couch with reclining seats, microfiber recliner chair, fabric covered love seat, book case, 32-inch TV, DVD player, area rug, artwork, books, games, and puzzles. Salt, pepper, sugar, spices, New Mexico salsa, ketchup, mustard, basic groceries and 6 bottles of water await your arrival. A wide variety of non-fiction & fiction books as well as many children's books. There is a hardback set of 15 Tony Hillerman Navajo mystery novels. There are also many magazines. There are playing cards, Scrabble, Uno, checkers, chess, Connect Four, Trouble, puzzles, basketball, a hacky sack & Frisbee. There is a folding game table and 4 folding chairs in the coat closet. Two bicycles can be made available upon request. The streets in our private community don't have much auto traffic and many people enjoy riding bikes around our community. The Sandia Ski Area is only 45 minute drive from the Albuquerque Metro area and fully equipped for a fun day on the slopes with a certified snow sports school, a complete rental shop, & skiers' cafe. Ladera golf course is 1 mile away. Albuquerque has many public and private golf courses. There is a community pool. Longer term residents (usually 2 months or longer) can qualify for membership providing access to the pool. Our private front porch sitting area features a wooden bench hand-carved in Mexico, a chair, small end table, and a hand-painted tile mural featuring a Mexican village scene. Our guests find both the front sitting area and the large, private patio to be relaxing spots after a day of seeing the sites of Albuquerque. The condo was cozy and warm. We would stat there again. We came to ABQ to spend some time with our daughter and her family. The place was roomy. It was close to shopping. My husband enjoyed the running trails nearby. Thank you Teri for your nice review. We are glad that Casa de Paz provided plenty of room for your family to celebrate your grandchild's birthday. I'm also glad that you had easy access to shopping and running trails. You left the townhouse very clean which made our preparations for our next guests so much easier. We hope you had a safe trip home since your part of the country was seeing some severe weather. Please keep us in mind for your next visit to New Mexico. Very clean, comfortable and many amenities that we weren’t expecting! Condiments, hiking books/maps, shampoo, soaps, laundry supplies and detailed instructions for everything in the house. We loved it. Hi Suzanne, I'm pleased that you found Casa de Paz to be clean, comfortable, and well stocked with amenities. Thank you for leaving the townhouse so clean when you left. And thanks for adding to the spices, cooking oil, etc. with items you couldn't pack for your trip back home. It was very nice meeting you two and hearing about your New Mexico hikes. You certainly packed a lot into your Southwest vacation. We hope you will return! Cozy, Clean - A Wonderful Place to Stay! Casa de Paz is the perfect place to stay! It’s easy to get to anywhere in Albuquerque. We are also ‘neat nicks’, so we appreciated how clean the townhouse was. It had everything we needed and our hosts were exceptional! We would highly recommend the Casa de Paz to anyone visiting Albuquerque! It’s a great place to make your ‘home away from home’!! Hi Becky, I'm pleased that Casa de Paz turned out to be your "perfect place to stay" for the two months while construction of your new home was being completed. It's good that our location was convenient to your new retirement community. Thanks so much for leaving the townhouse so very clean. That makes our preparation for our next guests easier. It was wonderful getting to know you and John. Cathy and I wish you the very best at your new home! We decided to visit ABQ on a whim and hadn't done much research before arriving. Casa de Paz was filled with great resources to introduce us to the city - from books filled with short hikes and where to find them to a folder detailing specific activities that were occurring that month. Charly surprised us by providing breakfast items so that we didn't have to run to the store early that first morning. The art in the home provides a beautiful sense of the surrounding peoples and communities. They've thought of everything to make your stay pleasant. Thank you, Candice, for your very nice review! Cathy and I are happy that you chose Casa de Paz for your Albuquerque vacation. I know part of your reason for coming to Albuquerque was to escape the cold winter at your home, so I'm pleased that our weather cooperated. I'm glad that you found our booklet of current events and activities to be useful for the time you were here. We hope you will keep us in mind if you ever need to escape your cold weather again. This is the best place we have ever stayed. The house was amazing and Charly and Cathy go above and beyond to make sure their guests are well cared for. Thank you seems so inadequate! Thanks for the wonderful review Bryan, Martha, Jacqueline, and Jennifer. You four certainly saw a lot of the Southwest during your Balloon Fiesta week visit: Painted Desert, Petrified Forest, Jemez Mountains, Sandia Crest, Bandelier National Monument, Santa Fe, Taos, and the balloons and Pueblo Indian Cultural Center in Albuquerque. Wow! You were great guests who left the townhouse very clean and picked up. Thanks! I enjoyed meeting and visiting with you. We look forward to your next Southwest adventure. Charly's Villa De Paza was the best VRBO rental we have ever had the pleasure to use. Even before arriving, Charly replied to our messages about how to get to the Balloon Fiesta and other recommendations. On arrival, we found that the refrigerator was already stocked and each in our group had a gift bag. The rental was filled with signs as to what each light switch operated, how to use the microwave, and a variety of binders on things to do and restaurants to go to. If we called Charly about something he would come over right away. Because of Charly our stay was wonderful and we look forward to when we can come back. Thank you Michael for your very nice review, and thanks for rating Casa de Paz as the best VRBO vacation rental you have ever used. Guest comments such as yours inspire us to continue providing the extra touches that make Casa de Paz exceptional. We feel that providing some basic groceries ahead of time help guests settle in by not having to immediately rush to the grocery store. You five were great guests. I'm glad you let me know that one of the door keys was not working properly so I could provide a new key to you. I'm also pleased that our list of restaurants helped. I know that each of you probably enjoyed the Balloon Fiesta. Most visitors who witness the launch of 600 colorful hot-air balloons find it to be an awesome and beautiful experience. I hope you will return! We are located near the intersection of I-40 and Coors Blvd. We like this location because of the quick and easy access to so many wonderful attractions. We are only minutes away from the Petroglyph National Monument, Old Town, many museums, the Botanic Gardens and Zoo, parks, Ladera Golf Course, hiking trails in the bosque paralleling the Rio Grande, Pueblo Indian Cultural Center, shopping, balloon rides, great restaurants, and so many other great attractions. We love Albuquerque because of the great quality of life including New Mexico's diverse cultures, life styles, history, art, architecture, food, dance, theaters, outdoor activities, and our outstanding university. Huffington Post calls Albuquerque one of America's "Five Secretly Cool Cities." ABQ offers authentic Southwest culture by the bucketful and is wildly underrated as a destination for lovers of the great outdoors. Noteworthy microbreweries like Marble and La Cumbre are the place to be once work is done. And let's not forget the seemingly endless number of multi-use trails, the cheap gondola rides to epic, high-elevation hiking, or the artisanal green chile cheeseburgers. Add in the region's unique multicultural heritage (think architecture, think a ton of good food, festivals, local traditions) and you've got a city that's not staying under the radar forever. Guests must purchase CSA Damage Protection Insurance for $59. Special rates can be arranged for longer term stays.